In 1689, François Dollier de Casson, Superior of the Sulpician Order at the Séminaire de Saint-Sulpice de Montréal, initiated the first attempt to build a canal that would bypass the treacherous Lachine Rapids. However this attempt was abandoned in 1700 and it was not until some 130 years later that a canal would finally be constructed.Work on the canal commenced on July 17, 1821 under Chief Engineer Thomas Burnett and Construction Engineer John Richardson. The canal, 14 km. long with seven locks, each 30 m long, 6m wide and 1.5 m deep was opened in 1825.The first enlargements took place between 1843 and 1848, under the supervision of engineer Alfred Barrett. Five new locks, each 61 m long, 13.5 m wide and 2.7 m deep replaced the original seven locks. 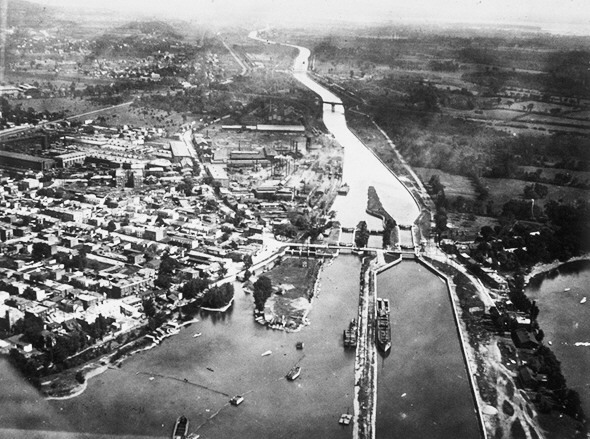 A second enlargement of the canal took place between 1873 and 1885 at which time the locks were lengthened to 82 m and deepened to 4.3 m.The canal continued to operate successfully until around 1950, but became obsolete in the second half of the 20th century, being replaced by the opening of the St. Lawrence Seaway in 1959 and was finally closed to shipping in 1970.